Can we be really scandalous and talk about money? I mean, when we talk about our honeymoon to Disneyland, people think we must have spent a fortune! Growing up, getting to go to Disneyland was something we dreamed of doing as a family if we won the lottery! When we said we were going to Disneyland for our honeymoon, people thought we were going all out for a couple on a budget. But realistically, when we sat down and worked it out, it was just as cheap to go to Disneyland as it was to go to Thailand! 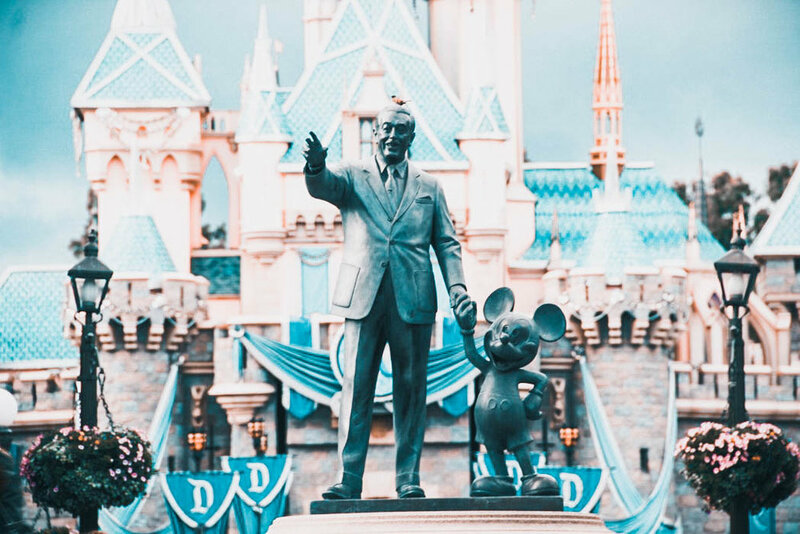 So, how much does it cost a couple to go to Disneyland for two days – including flights and accommodation? Way less than you think – even if you have a budget of $5,000 for your whole trip! 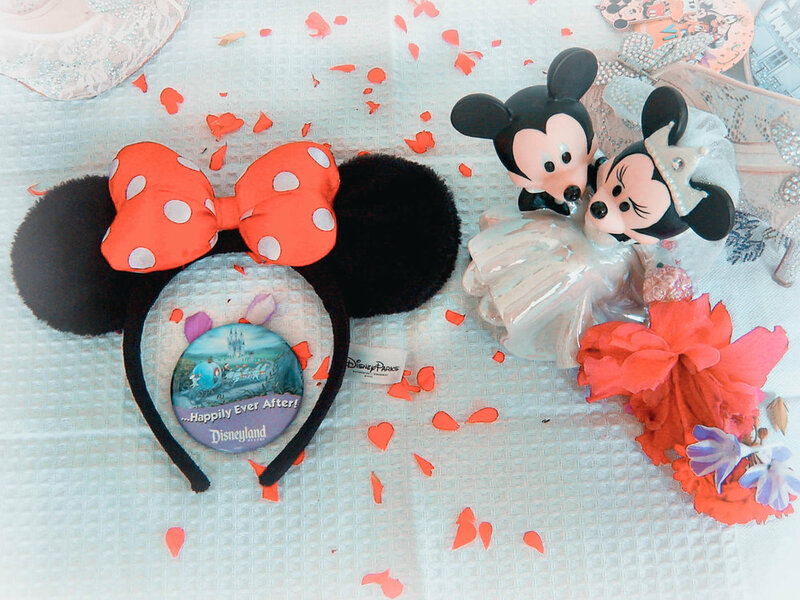 So here’s how much it cost two people on their honeymoon at Disneyland. Whilst we could have cut back on spending in a few areas, our budget allowed us to experience everything we wanted quite comfortably. We could probably do it for less, but we could have spent way more too. Here’s how we did it for under $3000 USD ($3,280 AUD). We got our flights to LA from Brisbane AU for such a freakin’ STEAL ($825 AUD return pp), I still can’t even believe how little we paid! We were very fortunate that our honeymoon fell on kind of a low season for travel to LA (mid-autumn). Before we booked, we deleted our internet cookies. We also booked about six weeks out from our trip, on a Wednesday (when prices are typically at their lowest). Signing up for a fare watch service and pouncing on airfares at the right price can save you hundreds, sometimes thousands. This works best if you don’t have particular dates in mind. We also booked through Budget Air, a fare comparison service, so we could compare the best prices from a variety of airlines. We didn’t book accommodation onsite at Disneyland. 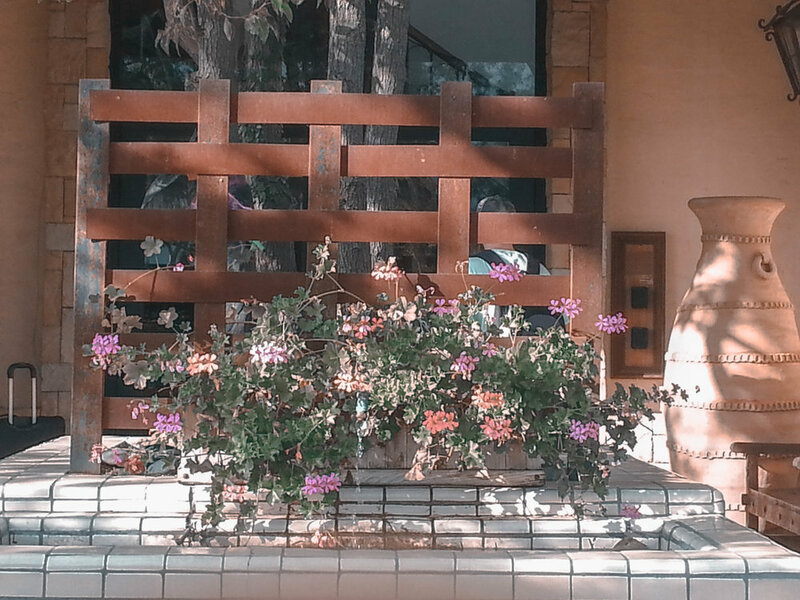 We chose instead to stay a convenient 10 minutes away at the beautiful Hotel Pepper Tree. (Disclaimer: we actually stayed for 5 nights. The price above includes what we paid for the Sunday before, the night in between and the night after our Disneyland days). I feel like we’d lost nothing by staying offsite. It was much cheaper than staying at Disney, much less crowded and more intimate (perfect for a romantic setting). Plus, it was conveniently located in between multiple Anaheim attractions. We absolutely loved Hotel Pepper Tree! It was so incredibly priced for the quality of the accommodation and we highly recommend it! See our review here! Probably one of the most expensive parts of the whole trip was the two day Park Hopper tickets. We highly recommend this option because it allowed us the flexibility to fluidly move through the day based on how crowded attractions were. We also had the freedom to schedule our days around specific shows. For instance, we went to Disneyland on day one but the fireworks weren’t on that day, so we drifted across to DCA and saw World of Color that night instead. We didn’t pay anything for breakfast on either day. Hotel Pepper Tree has a cereal, milk and pastry breakfast included, so we availed ourselves of that each day. We brought bottles of water with us, because a) I’m a bit of a health nut and would rather have soda as a treat than as something to guzzle on to quench my thirst and b) to save money. We were really not going to miss a big bucket of post-mix Coke enough for the expense. With just the two of us, we’re content to fill up on snacky things when our bellies are desperate for sustenance. On day one we grabbed hot dogs and Coke for $13.98 which came with chips. I treated myself to a churro (it’s a family tradition at theme parks) for $5, and we just HAD to try these pickles the Americans go on about ($4 each). (This, meanwhile has spawned a dill pickle obsession that has admittedly gotten out of hand). On day two, Greg wanted to try corn dogs, so we grabbed one each at a total cost of $17.50. For dinner on the first night, Greg surprised me with a special treat. He bought a World of Color character dining package at Ariel’s Grotto (Ariel is one of my favorite princesses!). This was a bit of a splurge and blew out our food budget for the trip at $97.16 for both of us. But fulfilling my dream of dining at Ariel’s Grotto and front row seats to World of Color? Totally worth every cent! 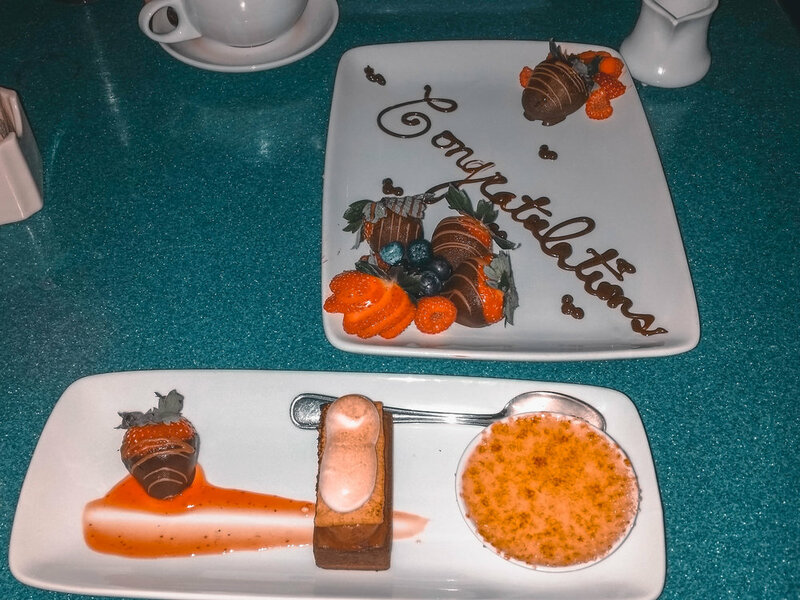 A lovely honeymoon surprise from the cast members at Ariel’s Grotto. We got a World of Color Dining Package as a honeymoon treat. It was a little bit of a budget splurge, but worth every cent. I didn’t leave a lot of room in our suitcase for souvenirs. However, we really wanted to bring gifts back for our rellies. We bought a mini Mickey/Minnie plush for each of our nieces and nephews (x 4), a Disneyland magnet for our parents and siblings, a commemorative Diamond Celebration plate (one for each of our mothers and one for ourselves), a wedding Mickey and Minnie ceramic figurine and I bought a pair of Minnie ears (because, obviously), a Mickey Mouse oven mitt and a Disneyland jumper (which is my favourite jumper of ever). Whilst I didn’t keep exact tabs on what we spent, by my best estimate we spent no more than $371 AUD on souvenirs. I feel like this was very restrained of us, and more specifically, me, given that I wanted one of everything. The tradeoff to staying in accommodation offsite is that you have to take transportation to the parks. Because we weren’t far away – just across the highway – a cab fare at $10 each way was quite reasonable. Despite one driver trying to take us the long way to Disneyland on the second day, we had a great experience. They were friendly, informative and provided excellent service. It was $10 well spent to get back to the hotel in minutes after a wonderful, but exhausting day. So, how much did it cost all up? I think perhaps the biggest savings was our cheap flights and cheap accommodation. We were lucky to stumble upon a real bargain with our flights. Our accommodation was fantastic value for money too. We saved money by eating breakfast at the hotel on both days, and bringing bottled water with us. Ariel’s Grotto was a splurge. We could have saved ourselves $70 odd by eating at Captain Kidd’s, but it was a spectacular experience that I feel was worth the extra expense. We probably didn’t NEED, per se, to spend as much as we did on souvenirs. However, the things we bought still bring us joy every time we look at them. Plus, it warms my heart to see my nephews and nieces cuddling the Mickey and Minnie plushes we brought back for them. If you were on a tight budget, this is at least $200 you could cut out and still have a kickass trip. So, there you have it! As you can see, we came in at just under $3,300 AUD ($2,474 USD) for two awesome days at Disneyland. This included overseas flights from Australia to LA, accommodation and two days packed worth of wonderful experiences. To some it may still seem extravagant: to me, it seems like amazing value for an unforgettable experience.